LensFerry is a secure, cloud-based commerce solution that gives your patients the convenience they have come to expect—being able to order lenses from their doctor on their phone, computer or tablet, and receive shipments at their door. The seamless integration with your EHR allows your staff to save time and automate messages. Give your practice automatic multi-channel selling capabilities—so you can drive lens sales even when your store isn’t open for business. Patients text “Order.” Yes, that’s it. Patients who leave with only a prescription in hand are likely to shop around. 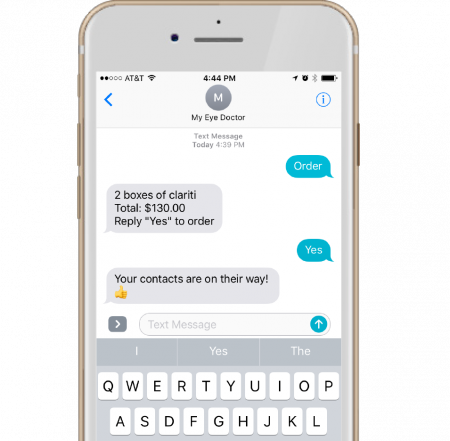 Pull them back before they get too far with a ‘1-click-away’ order message that includes their personalized brand of contact lenses and prices. When it’s time for patients to reorder their lenses, make sure they think of you first. Based on our smart AI algorithm, patients will receive automatic intelligent reminders before their lens supply runs out. Subscriptions give patients the option of spreading out their payments over time and the convenience of home delivery. Not only that—subscriptions eliminate the risk of running out of lenses! We want to give your patients the opportunity to join us in giving the gift of vision to people living in underserved communities and in desperate need of vision care. As supporters of the charitable organization Optometry Giving Sight, we will make a donation toward an eye exam for a person in need each time one of your patients purchases an annual supply of lenses through LensFerry.